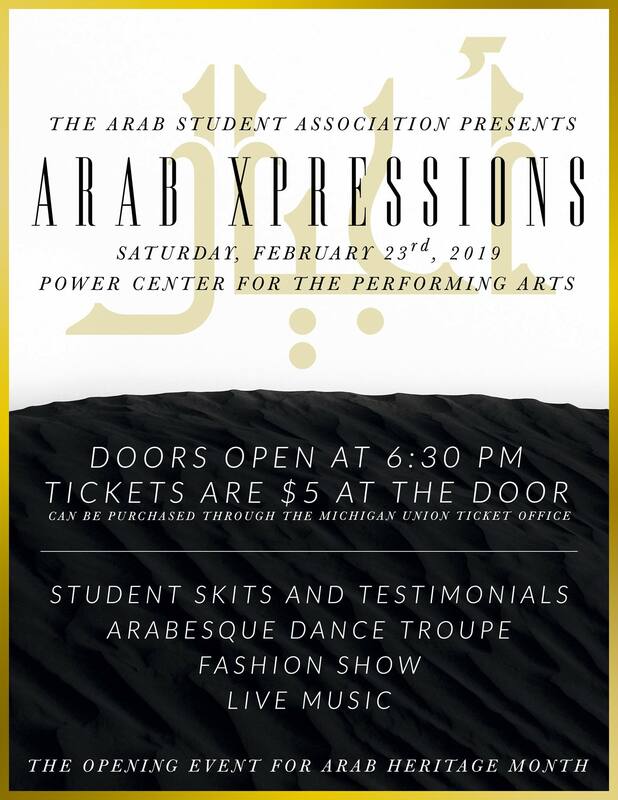 One of my favorite events last year was Arab Xpressions put on by the Arab Student Association, so my expectations for Arab Expression 2019 are high. I have every reason to believe that those expectations will be met for tomorrow evening’s show. 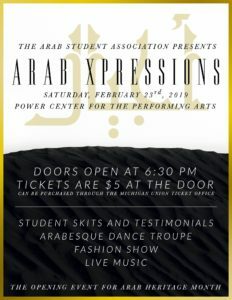 The community of students involved in Arab Xpressions is highly dedicated to this annual extravaganza so they’ve been practicing since the Fall. Arab Xpressions is truly a unique experience in that you can spend a night getting a glimpse into the diverse cultural heritage of the Arab world and, more specifically, the Arab community on campus. Last year’s performance was particularly unique as it highlighted the work of Arabs on campus and in the state of Michigan. On campus, the Arab community successfully petitioned the school to have Middle East/North African added as a racial/ethnic category on official documents and worked to have the divestment proposal recognized by Central Student Government. Abdul El-Sayed, democratic gubernatorial primary candidate, was also featured at the performance. Other parts of the performance which we can be assured will return this year is the fashion show and many dabke dance troupes. One of my favorite parts of last year’s show was the many different interpretations of dabke by the various troupes put together for Arab Xpressions. I’m sure there will also be plenty of musical performances and spoken word, as well. This event is at 7pm tomorrow, February 23rd, at the Power Center and tickets are only $5 so make sure you’re there! Image courtesy of the Arab Student Association.